Everyone knows that Greenland is the world's largest island and the Caspsian Sea is actually the world's largest lake, and not a sea as it's name suggests, but what about the world's largest island on a lake, on an island, on a lake, on an island? That title goes to Vulcan Point (see it on Google Maps) in the Philippines. Treehugger has a great series of zoom-in photos that show you how that complicated geological title actually makes sense and how it's possible. 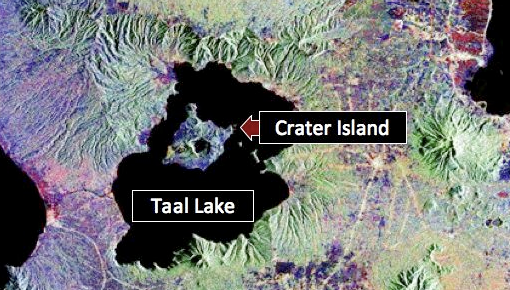 For those that couldn't be bothered, it's Vulcan Point within Crater Lake, on Taal Island within Lake Taal, on the island of Luzon. Pretty amazing place this earth we live on. I think NASA are wasting their time on Mars. Earth is way cooler.